It was a day like any other. The evening rush hour heralded the weekend, which in Iran starts on Thursday. 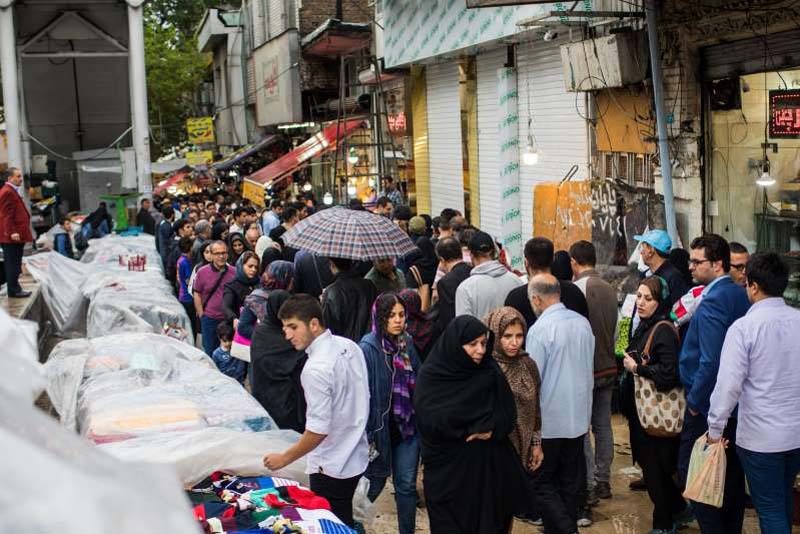 People crowded the sidewalks of a West Tehran square, making their way home or to restaurants. A young street musician wearing a baseball cap and sitting in a wheelchair sang “Someone Like You” by Adele. His sister played keyboard. “I don’t understand the words, but it’s beautiful,” one passer-by told a friend. A man walked past with fresh bread. Two teenagers sitting beneath an underpass smoked and giggled. It was easy to forget that the lives of those making their way home here had been changed with the stroke of a pen, thousands of miles away, this week when President Trump formally withdrew from the nuclear accord between Iran and six world powers. Life can be like a roller coaster in Iran. Ordinary people can do little more than hang on through the twists and turns as their own leaders, and sometimes foreign ones, chart a course. Rarely are they in control. Iranians were thrown into another corkscrew when Mr. Trump pulled out of the agreement, which many here had hoped would give them peace of mind and prosperity. Now they face new rounds of sanctions, along with an economy already riddled with corruption and mismanagement. Normal people tried to go on with their lives. Those who had taken hope from the more open atmosphere the nuclear agreement brought — at least for a time — were licking their wounds. Iranians who took part in the recent protests that swept the country and businessmen alike struggled to adjust to the new reality. In the desert town of Kashan, a lawyer and human rights activist, Nasrin Sotoudeh, was in court defending a woman who had protested against the compulsory Islamic head scarf. Ms. Sotoudeh, who herself has been in jail numerous times, said the nuclear agreement had provided breathing space for those critical of the government. In Tehran, Hamidreza Faraji, a businessman, also pointed a finger at hard-liners. Mr. Faraji, 35, opened a perfume shop after the nuclear agreement was reached in 2015. Business growth seemed to be on the horizon. Iran’s leaders promised a bonanza with the arrival of foreign investors. “I thought there would be more money around, and people would buy more perfume,” Mr. Faraji said. He sat in his store for many fruitless afternoons, giving high discounts to the few customers who came. Then last week he closed up shop, to prevent further losses. Still, life went on this week in Tehran, as it did during the 1979 Islamic revolution, the eight years of war with Iraq, the recent anti-government protests and the years of sanctions. Mr. Akbari, the student, had not even bothered to watch the news when Mr. Trump made his announcement. He woke up on Wednesday, made his way to university and sat down in class. Another student told him that the American president had given a big speech and that sanctions would return. In Tehran, the metro station filled up and drained empty of passengers. The pink bus driving up from Shahid Beheshti Street stopped at Sadeghiyeh Square. Elderly women got out. The bus driver turned around for another round. Daily routines — but something felt off. A doctor carrying two shopping bags asked me if I had a job for her daughter. “Well, would you work for that?” she asked. Another man, who gave his name only as Amir, did not want to talk about Mr. Trump’s decision at first. A 36-year-old father of two boys, he was sitting in a tiny booth in the Golriz shopping center, selling water pipes and Zippo lighters. Few people in Tehran took part during the nationwide protests in over 80 cities in December and January. Most middle-class urbanites thought the protests were more an outpouring of frustration and anger than a movement with a clear goal. After the United States withdrew from the nuclear accord, one Tehran resident who did participate in the protests said she hated Mr. Trump. But she also said she would still take to the streets at the earliest opportunity. “Right now, people fear instability and they prefer to hang on to the little things they have and not risk anything,” said Shadi, a 28-year-old piano teacher. “But I am prepared to go out again to protest.” She did not want to give her family name out of fear of retribution. On the streets, many blamed both Mr. Trump and their own leaders for their misery, although it was clear who ultimately had pulled the plug on the deal. “Trump made us miserable,” said Fatemeh, 22, who works at a store that sells veils. She did not want to give her family name, and only smiled when asked for a reason. A woman with two teenage daughters walked in and overheard the conversation. Soon, she got into a debate with a man. “Everybody is destroying us,” she said. “We have seen the war — this is nothing,” he replied. Some saw only one solution, however improbable it seemed at the moment. “They should sit down and talk — our leaders and the American leaders,” said Mohammad Hossein, 28, who sat behind the cash register of a coffee shop. He, too, did not want to give his family name, especially after his boss, Alireza, showed up and said he not want to give his name. “Nobody here talks about the nuclear deal,” Alireza insisted. “Two people in the morning did,” Mohammad Hossein quipped. Several streets away, Mohammad Amiri, 27, stood on the pavement, selling cactuses. He had listened to the car radio while coming to Tehran from Karaj and had heard the news. Mr. Amiri said there was blame enough to go around. “No one is oppressed in this story,” he said. One woman inquired about the price of a very tiny cactus, which Mr. Amiri had grown himself. “It took me a year,” he said. Mr. Amiri told her the plant was just over a dollar. “7,000 toman — or take it for free,” he said. “This is such a beautiful song,” he said. I asked if he had high hopes himself.